Going over the calendar is an important rug time activity. It's hard to figure out days, weeks and months as a little kid and how long each last and how they work together. Check out the following categories for some fun coloring pages that are great to use at school and home. Enjoy! Sunday through Saturday Coloring pages. 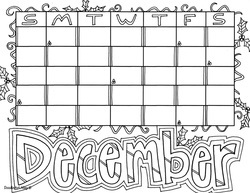 All 12 months in Coloring page format. Calendar pages for each month. Enjoy!